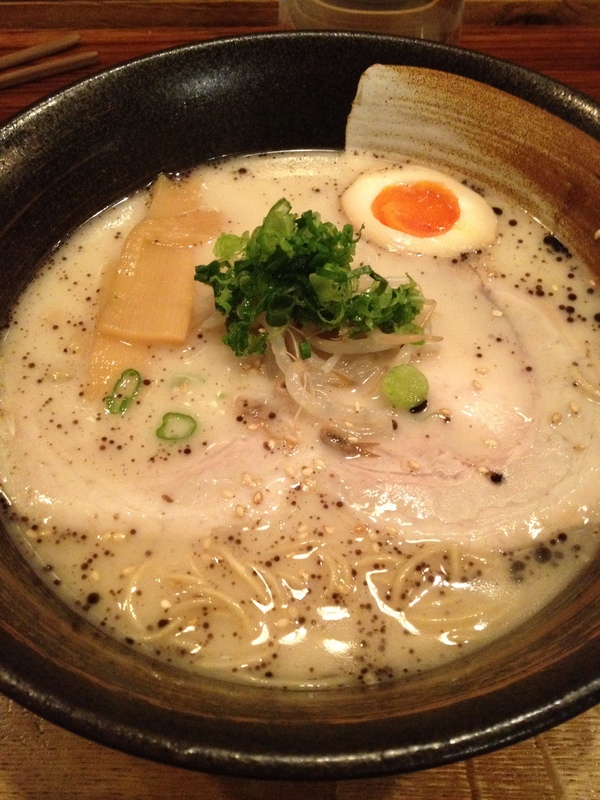 Home » ★★☆☆☆ » Tonkotsu. That is all there is. Tonkotsu. That is all there is. I was in the market for noodles. I’d had a ramen epiphany earlier in the week, and I just had to go back and try again. And please don’t tell me that you have been to Wagamama and don’t like their big soup-bowl noodles. I’m with you. Neither do I. There are a few similarities between that and this. Noodles, stock, meat. That’s it. Even though I was desperate to revisit Bone Daddies, I try not to go to the same restaurant twice in a week (yes, I do know how that sounds, but I am that woman) I thought I would give Tonkotsu a go. I walked in to Peggy Lee singing, “Is that all there is?” which is fairly spot on as a description of the menu. I’m not complaining, I’m just saying¹. I mean there are a few extras, like gyoza, but to go on about them would be missing the point. Because it’s all about the ramen. And I noted with surprise that there were some people over 25. A novelty. It’s dark inside and decorated in lots of wood and plays grown-up music. I sat at a bench facing the prep area. This is for people who are eating alone. I liked it. I could be anti-social without feeling out of place, for this is the sort of place you can go to on your lonesome. No happy smiley service here, à la Bone Daddies. A bit low-key. A bit leave you alone, a bit too much. A bit not bothered. Which was fine because I was feeling a bit not bothered myself, but there was no real serving enthusiasm and the difference between this and Bone Daddies was noticeable. But maybe it was the fact that it was a freezing, sleeting mid-afternoon on a Sunday and I wasn’t seeing it at its best. Or maybe that is all there is on the service front. And just to digress, what happened to Wagamama? When did it lose its Ramen way? I remember when it first opened. In that basement near the British Museum, designed by John Pawson and beautifully new and minimalist, I used to queue for what seemed like hours. Yes. Me. Queue. I was younger then and less grumpy old woman. And I remember it being good. But maybe it wasn’t and maybe other things have got so much better, that it now seems just mediocre. Maybe a bit of both. Here, it’s all about the stock. 18 hours of bubbling away, apparently. A deep and rich flavour, with sliced meat layered on top, beansprouts and noodles. Here’s one it would be difficult to replicate at home. And the whole experience was very different from Bone Daddies and I suspect more authentic. Not that I would know anything about authenticity in ramen, coming from north Manchester. And I do like it. Not as much as the knock my socks off Tantanmen, but enough for me to want to go back again. The stock is cloudy and rich and the noodles are light and delicate. They make their own noodles with a machine they imported and they make much of it on their disposable menu. They are noodle purists. As it says on the menu, if you don’t make the noodles yourself, you’re just a soup shop. I’m not sure that my noodle palate is sufficiently sophisticated know the difference between home-made and imported ramen, but here, they are very good. Like a silken vermicelli. And I also had the spinach and bean sprout salad with a sesame dressing. A bit drowned it was, and a bit thrown on the plate. The flavour was fine, but it was a bit soggy. I wouldn’t bother. I spotted a garlic shot on the menu, which was to be added to the ramen and felt compelled to order it, safe in the knowledge I wasn’t actually going to be within ten feet of anyone that evening, but I really couldn’t taste it. I know I’ve got asbestos mouth and I have developed a tolerance to chilli (you do, eventually) but I wasn’t sure where it was. Maybe they forgot. Nevertheless, tasty satisfying and fresh, this was a great meal in a bowl. And only £11. ¹See Rita, Sue and Bob too, for best use of that line ever.